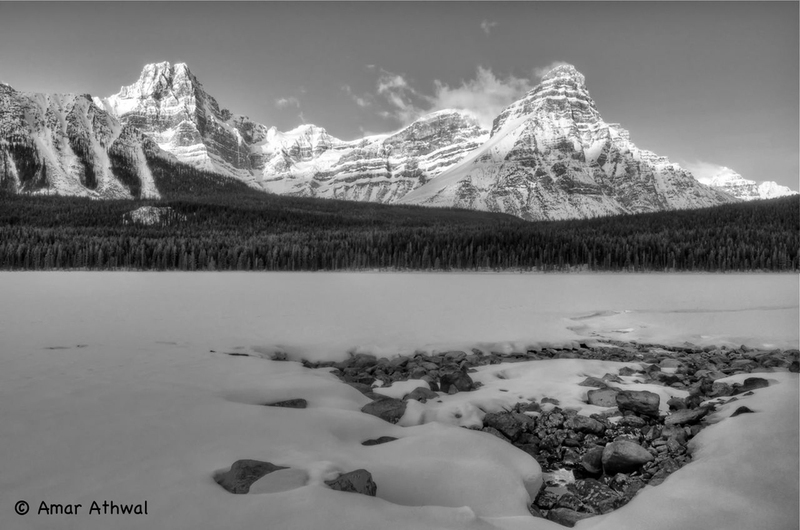 I started the days adventure at upper Waterfowl Lake, with the goal to snowshoe to Mistaya Lake. Snowfall in the mountains has been below average this winter, but here along the Waputik Mountains below average is still enough to play with. But first thing first, need to capture the morning light. Standing on the east side o the lake, I started to take pictures of the mountains across the lake, as the light made its way toward the bottom of the valley. It was a cool morning, I wanted to start moving and to get back some of the heat I lost taking the picture of the sunrise. Was hopping to head for the other side of the lake where the sunlight would be hitting soon, but was having way too much fun exploring the side of the lake I was on. Exploring places I wanted to come back to take pictures in winter and during the summer. I made my way toward the small section of the Mistaya River that connects Waterfowl Lake to the Mistaya Lake. Due to low temperature mist was rising from the open running water, visible from a distance as the the sunlight came in contact with it. Being careful to stay on solid surface as I walked along the running water, open in some area and covered by ice and snow in others. Water was cool and clear as the surrounding landscape reflected off the water. Walking with snowshoes, made it easier to walk on the snow and at the same time carry the camera on the tripod. So many place to take pictures, would be great to return and capture the early light on the mountains being reflected in the water. I was seeing so many possibilities for pictures, every few steps produced a unique opportunity for pictures. I was so involved taking pictures of the landscape , did not the mountains were holding a surprise for around the corner. A surprise that heard me coming. To be contuined... .